Well, that was summer. 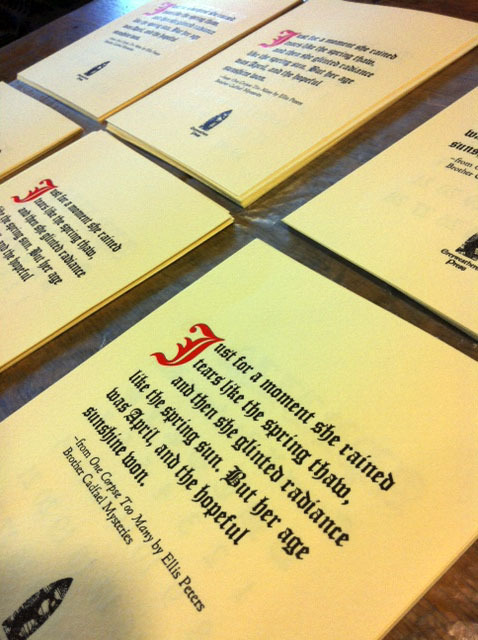 In the midst of an enormous burst of work, and some personal obligations, I managed very little in the way of printing. 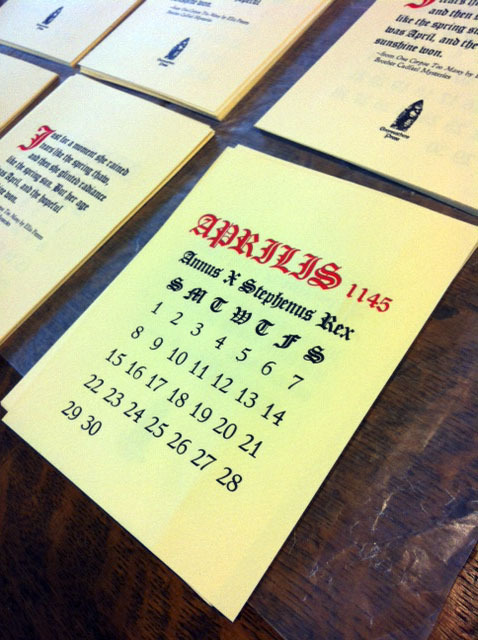 So thank goodness for the Ottawa Press Gang and specifically Steve Quick of Weathervane Press, who came up with the idea to do a calendar project for 2012, hoping that the various Ottawa presses would do a month each. I chose April, the month of my own birth. I had the black done some time ago, but our busy work schedule prohibited printing the red until just yesterday. I have very little blackletter type. I even had the quote above set in the house font, Italian Oldstyle when I discovered a unlabeled tray of 18 point. Even setting the headings over the calendar was touch-and-go. I hasten to add the only reason I have any blackletter at all is that Holly thought she might use it in her art work! But now I’ve got a couple of ideas for using it, and may borrow some blackletter typefaces in the future. That happens sometimes when you settle into a particular face on a particular project. You may note the figures on the calendar are Italianate, not Northern Gothic: I would have needed 13 figure 1’s and 13 figure 2’s to complete it…. Not even close. As the saying goes, I was out of sorts, so one must use the resources one has at hand. Let’s call it a transitional calendar. I’m back in the blog, but starting off by riding on the coat-tails of fellow letterpress printer and book dealer extraordinaire, Rick at the Bytown Bookshop. He’s done a great write-up on the Gathering of the Gangsters here in Merrickville this past July. More on Bytown Books in the future.